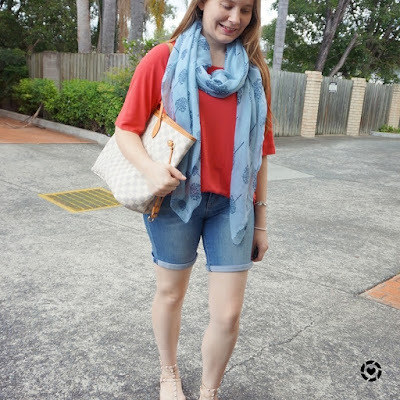 Cute and comfortable summer looks! I love those RM sandals! They really do "dress up" a casual outfit in a perfect way. I also had to laugh because I did a double take when you said you went to an ABA meeting. At first I thought it said "ABBA" meeting and I was picturing something else entirely! LOl!! I love how you're wearing scarves in the summer! Adds a fun pop for sure. I hope you have a Merry Christmas! Light ones like this work well when it's not too hot! The scarves add a wonderful bit of interest to the outfits, Mica!! I just love that you are willing to add those in!! I love your outfit. The scarf along with the bag have nice contrast. Great summer/spring outfit. I cannot wait to pull out my shorts and wear them . Here it is quite cold and I am pretty much with my winter heavy coat all the time. Can you dress me?! I feel like I never know how to wear a slouchy tee without looking like I'm swimming in it hahaha! It's hard to resist buying a good t-shirt when you find one. Love your bag with both of these looks too. I have been considering buying one for a long time. I watched part of your video. Do you have any about how to properly weather/wear the patina? I really want a Neverfull- they're awesome! Wishing you and your family a wonderful holiday and a very happy new year! Thanks Rowena! It has held up really well! I really love the slouchy tee's you're styling here and I prefer them over fitted tee's! I like my body to breath in the summer. I feel like it is always so hard to come up with outfits in the summer and the scarf def. adds some color and a little something to this basic outfit! Love the Louis Vuitton tote! Both of these outfits are gorgeous and I like these scarves, they are really beautiful! So cute in tee and shorts. This reminds me how much I can't wait for spring/summer! I can totally understand why these tees have become staples in your wardrobe:) They look great and so comfy! And those scarves are fab accessories to boot. Love how you paired the dark green with the blue. Anyhoo, just want to wish you and the family a lovely Christmas and New Year, Mica:) God bless. I love that you're always getting your clothes at such a great deal. Your outfits look great. 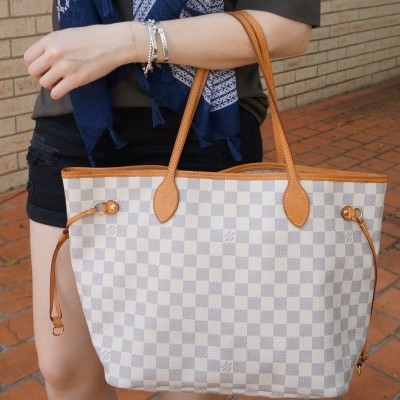 Oh man, you make me want to get a neverfull LV tote of my own! You're totally rocking the scarves as well. I am digging the price of your glitter shoes. I completely agree that a scarf has the potential to completely transform a look in the best way. I love the comfy outfits you shared. 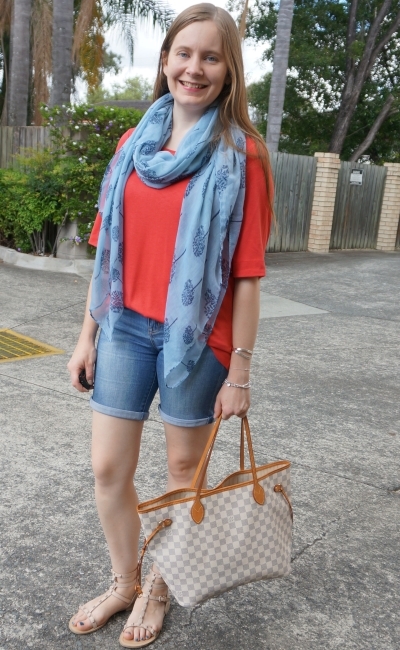 A shorts, tee and scarf combination is a wonderful classic. I like both of your outfits. 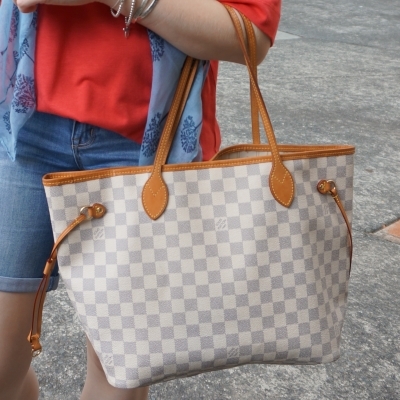 Love the LV Tote! You wear scarves like no one else can! Happy holidays Mica! 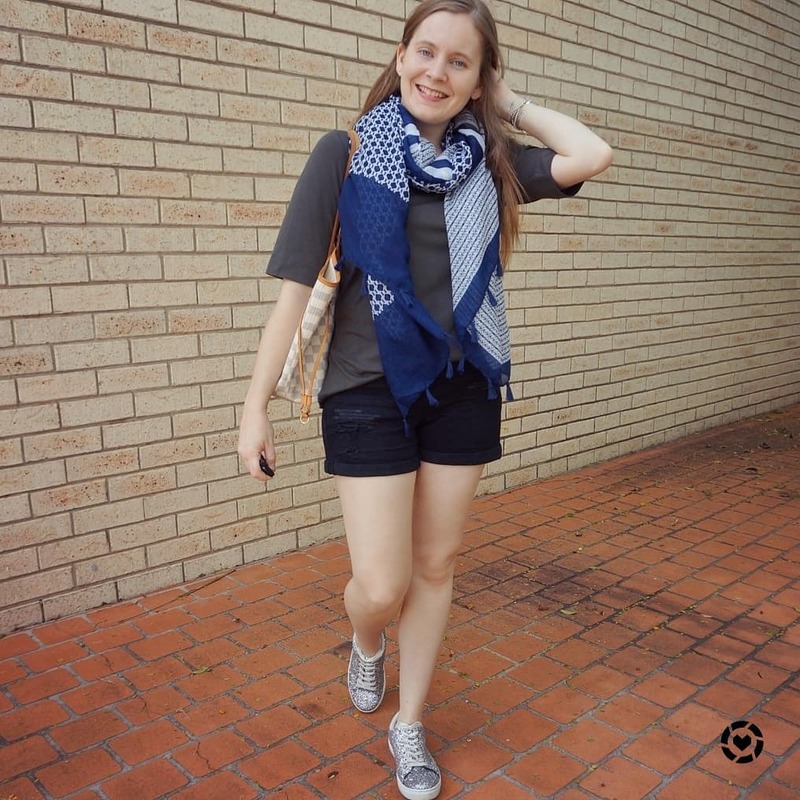 It is so true that a scarf can make an outfit more pulled together. I'm somewhat of a scarf addict and I love how you wear yours. That first outfit is super cute, it doesn't look hurried at all. The second outfit is fabulous as well. You wear shorts so well. Yes, it's time for shorts again. I like both looks for unpredictable cold snaps on a summer season. Have a happy holidays! I love both outfits and scarves but I would prefer to wear the second one :) Pretty as always! You look great in shorts - it really helps that the length on these is a bit more modest than most jean shorts! I love that you go that little bit extra and add a scarf or sparkly shoe, Mica. Wishing you a very Merry Christmas! Hugs to you, my bloggy friend! Thank you Sheila! I do prefer longer length shorts at the moment, haha! :) Merry Christmas to you too! Cute scarves dear. Love the patterns. A slouchy tee really is such a staple, but I don’t own one. All my tees are fitted, and that isn’t always the best option. They can still be a go-to staple though! I just prefer slouchy tops, haha! I just love those breathable tops and those sparkly shoes are so fun! I wish we still had Kmart here! You are so good about wearing your scarves! these are very nice summer outfits. I see your slouchy shirts are definitely wardrobe staples and I love it really both times how you combined them. 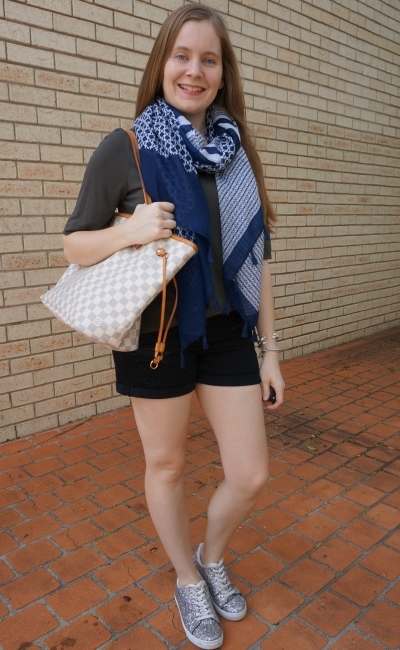 It looks super cool that you added a scarf to the shorts and tee looks and I see your Neverfull is also so versatile. I love this chic and effortless stylish look. This tee looks so comfy, and I just love the orange color! You can never go wrong with a t-shirt and short combo. Love the orange with the blue. Have a wonderful Christmas. Love how comfy it looks with that denim and slouchy top! Love that bag on your shoulder! Both of these looks are so cute! I love your RM sandals and those sparkly sneakers! Merry Christmas! I love both of these looks! Those silver glittery sneakers are fabulous! Thanks for linking up! That sounds like a great walk, and a perfect outfit for a nice leisurely hike. Don't you just love it when you buy something and they work with everything like these tees ? I like both looks and totally agree scarves take it to the next level.